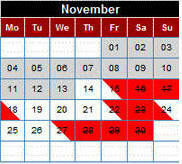 How to read and interpret the calendar - A red block means that night has already been reserved. A white block indicates that night is currently available. A block with a red triangle in the upper right corner means guests are arriving the afternoon of that date. A block with a red triangle in the lower left corner means the guests are due to check-out that morning and the room is available that afternoon. For example, referencing the small sample calendar to the right, the night 14 Nov. is available, but a guest has already reserved the nights of the 15th through the night of the 17th. Then, since the 18th has a red triangle in the lower left corner, that indicates the guest will be checking-out the morning of the 18th and the room is again available the afternoon of the 18th. We sincerely hope the nights you desire are available - we'd enjoy having you as a guest at our special bed and breakfast.